We pride ourselves in being the world’s first and only company to bring together data from over 18,000 sources. Our research analysts source the most up-to-date statistical data from around the globe; our analytical approach and efficient research processes enable us to supply our clients with the data that is relevant to them. Each one of our research analysts works exclusively within their respective field of expertise and collaborates with industry leaders to ensure that reliability and accuracy is maintained across the board. We keep our finger placed firmly on the pulse and closely monitor trends and progressions in all aspects of our business. Our database evolves and progresses in step with the newest trends as they occur, meaning that we are always up-to-date. If you are a regular user of Twitter or Facebook chances are you have seen your fair share of videos and photos featuring cute/cuddly/grumpy and/or funny cats. Here’s our inofficial ranking of the internet’s most popular cats! I don’t know what “inofficial” means, but I think it might mean that, when it comes to business analytics, quants still need poets. 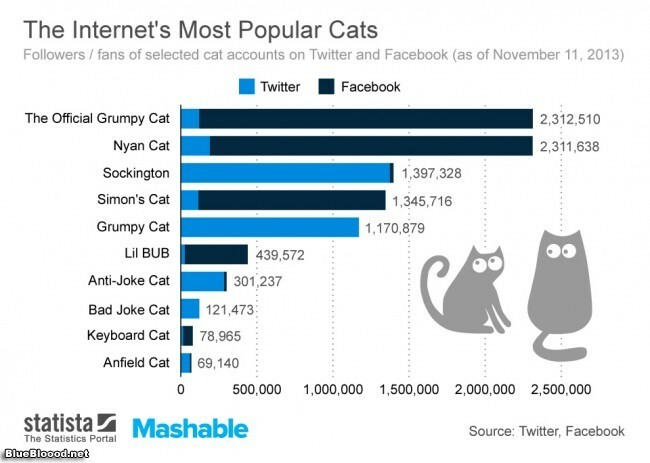 Quantitatively, I’d also point out that Grumpy Cat appears to make the list twice. Perhaps, they need a footnote on how his social media is broken out. Anyway, Grumpy Cat is far out-pacing the still quite popular Nyan Cat, Sockington, Simon’s Cat, Lil BUB, Anti-Joke Cat, Bad Joke Cat, Keyboard Cat, and Anfield Cat. Put the two Grumpy Cat profile measures together and that kitty cat pretty much beats all the other kitties combined. That is my inofficial analysis anyway.